14:00 Where else is the money? François Nel, director of the Journalism Leaders Programme, presents some highlights from a two-year research project into the online revenue models of news publishers in Britain’s 66 cities. An exciting range of high profile speakers have been lined-up for the Winter meeting of the Digital Editors’ Network on February 3rd . 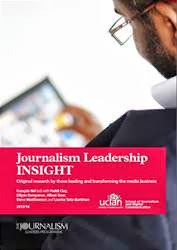 The free event at the University of Central Lancashire in Preston will include:An insight into the digital transformation of the Daily Telegraph when Mark Skipworth, executive editor of the Daily and Sunday Telegraph gives the University’s Harris Lecture. A discussion about how newspapers can best make use of their archives in the digital age with a presentation by Patrick Fleming, head of reader and reference services at the British Library. He has been the driving force behind its newspaper strategy which has already seen digitization of more than three million pages of searchable content from national and regional newspapers.